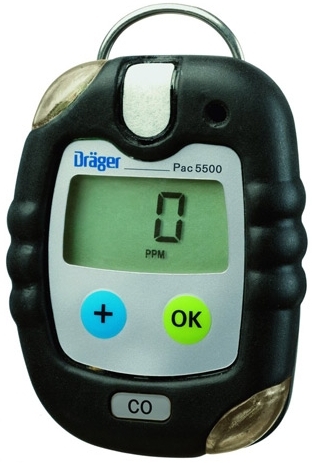 Ideally suited for personal monitoring applications, the Drager Pac 5500 provides quick detection of carbon monoxide, hydrogen sulfide or oxygen. Accurate, reliable and easy to use, this small, ergonomic instrument has no lifetime limitation. Small in size and light in weight, the Drager Pac 5500 has been developed with the needs of industrial users and applications in mind. Providing easy, single-handed operation, even when wearing gloves, it is designed to withstand the toughest environments. The impact-resistant rubber housing is impervious to corrosive chemicals and meets the requirements of IP65 to ensure operation even when projected with water. The instrument's sensor has been specially positioned to allow gas access at both the top and front so that gas detection is continuous if the unit is placed in a pocket or if a gas inlet is accidentally covered. Designed for long-term operation, the Drager Pac 5500 boasts an unlimited lifetime. The battery and the sensor can be easily replaced on-site and without any additional equipment. Also, the dust and water filter on the front of the instrument can be replaced when clogged with dirt or mud. Incorporating the latest miniature Drager XXS sensor technology, the Drager Pac 5500 has been specifically developed for use in personal monitoring and handheld applications. Offering a long, expected lifespan from 5 to 8 years, these innovative sensors combine high performance with a fast reaction time of just ten seconds. Clear and easy to see, the large liquid crystal display shows both the gas concentration and the measurement unit. As an option, the instrument can also be configured to display just the type of gas. The concentration is then displayed only when the set alarm levels have been exceeded. Language-free to avoid any misunderstanding, this continuous numeric display can also be back-lit to improve readability in darker environments. In addition, labels in yellow (hydrogen sulfide) and blue (oxygen) are available to ensure that the instrument can be identified quickly even over a long distance. In addition to vibrating and audible, multi-tone alarms, the Drager Pac 5500 issues a clear, 360° visual alarm via bright, flashing LEDs at the top and base of the instrument. Alarm thresholds can be set by the user, and gas alarms include both a pre and main alarm. Bringing maximum confidence to the user, the instrument will also emit both pre and main alarms before loss of battery power. Should there be a problem with the electronics, the battery or the sensor, the user will receive a clear, immediate fault alarm and display indication. A further "life signal" option, which can be activated and/or disabled to suit specific requirements, is also available. Most national regulations require users to test equipment against a known gas concentration on a regular basis. Bump tests check that instruments are functioning correctly. Equipped with adjustable bump test and calibration intervals to meet the needs of different applications, the Drager Pac 5500 displays a warning as soon as a bump test or calibration is required. Should the warning be ignored, the instrument will automatically display an "out of order" error message. As an option, users can also select this same error message to indicate that the calibration interval has expired. Bump tests usually take between 8 and 15 seconds and to ensure that they can be performed quickly and easily, the Drager Pac 5500 can be used with the Drager Bump Test Station. This economical unit allows both the instrument and sensor performance to be checked anywhere, without the need for additional power. Each successful test is automatically stored in the data logger whilst unsuccessful tests render the instrument "out of order". An optional mobile printer is also available for those applications where hard copies are required. Fresh air calibration is requested within the boot sequence at start up and is easy to perform. Calibration can be carried out in the workshop by docking the instrument to a PC, and an optional automated test and calibration system is also available. The recommended inspection interval for Drager Pac 5500 is 2 years. Able to store up to 60 events complete with dates and times, the Drager Pac 5500 incorporates an IR interface and can be easily linked to a PC via a connecting cradle. As a result, significant events such as switch on/off, gas and battery alarms, error modes, configuration changes, fresh air calibrations and bump tests can also be downloaded, printed and stored.